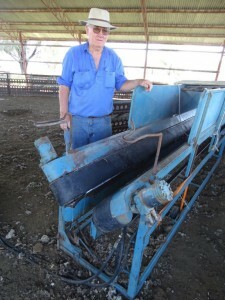 Dohne prime lamb producer Ranald Warby is quick to acknowledge the benefits of his Arrow V-Express machine after just five months of use, particularly the fact that it allows him to perform a number of tasks on his sheep in just one pass. Gone, too, are the days of fighting rams in a race when drenching and the usual tired back after a day of crutching lambs. The V-Express is a portable sheep handler that features hydraulic belts on either side that move the sheep along in single file, enabling the producer or contractor to mouth, drench, vaccinate, tag and backline before tipping them on their backs to crutch, scan or trim their feet.